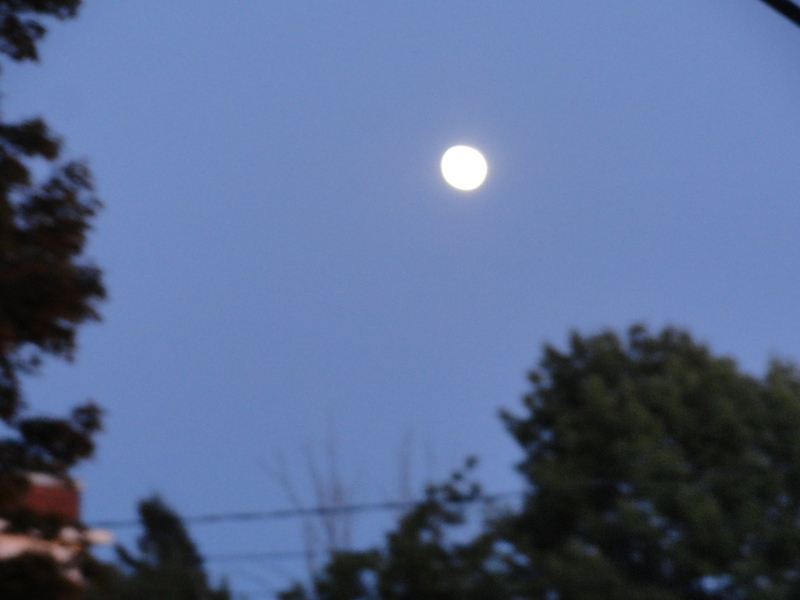 When I look at the moon, I’ll remember you, and wink. and the wedding tent as I promised, two weeks ago. Two weeks in one: The paintings of the trees at Flye Point, Brooklin, Maine, USA. The smaller painting, “Wedding Tent” was my primary painting. 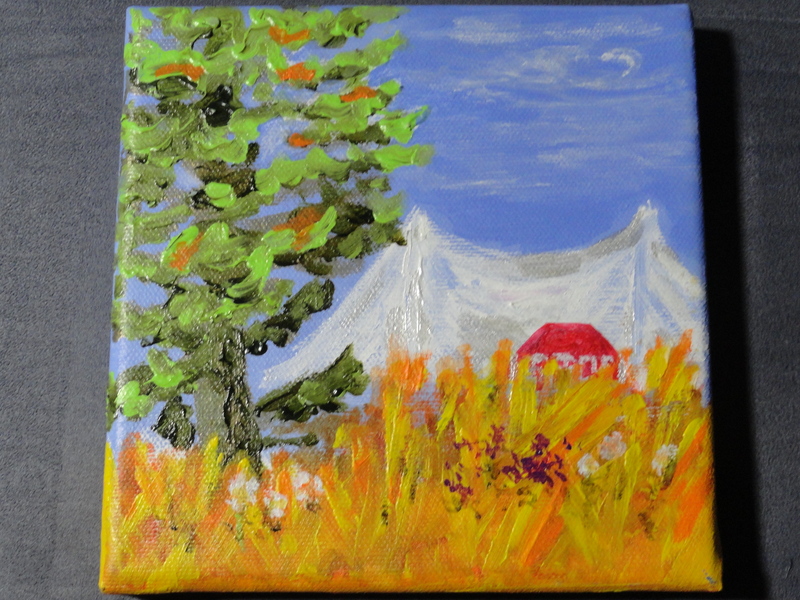 The Wedding Tent at Flye Point, Brooklin, ME, USA 6″ x 6″ acrylic on canvas. Painted En Plein Aire (in fresh air or outside on site). “Wedding Beauty” 12″ x 12″, acrylic on canvas. Painted En Plein Aire. The mountains across from where I was painting “The Wedding Tent”. 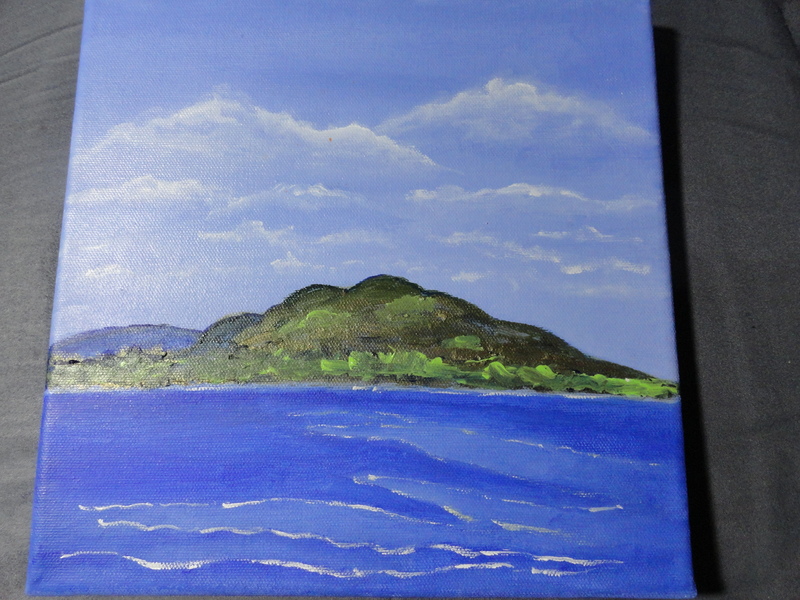 While waiting for the paint to dry on the smaller painting I painted the site across the water. I was told that at low tide, the previous Friday, a couple was married here on the huge rocks at the shore line that are covered during high tide. The trees look to be a solid mass due to the distance from shore to shore. Thanks Becca for sharing your site. just a note as to why I’m not blogging much lately. I just couldn’t get beyond being tired and in unbelievable pain. (there is heavy lifting at twice a day…I can’t do that alone). after she fell and had surgery on her shoulder…. was arrested by drug enforcement authorities…. August 18 I posted this on Facebook. This is the quickest way for me to update everyone. 1. I locked myself out of my computer August 12 for a few days last week. 2. I’m working…day six of a 21 day stretch ! … the stretch ends September 2nd. the results are wonderful for 6 months when the pain and reaction to the injections resolves…. 4. Monday, August 20, major dental work … follow up to the fall that gave me the black eye, stitches in my forehead and destroyed some teeth. So, it will be at least til the end of the week…or sooner. and “invisible except for photos for a while ! The opportunity for awesome photos at work is endless. G. … ex #2 is helping me, so we are splitting the pay…$15 ! I don’t think that is minimum wage…. and it is split shifts…8 am to 11am, 4p to 7 pm … no good deed goes unpunished. but it has been thru pain, suffering and putting on a smiling face. It eliminates most of the schedule that I loved for art, music, special events. But, it will pay for the dental work which is a blessing. 3. The knees finally don’t hurt as of today August 24.
and I have no fear of going to that office at all. I’d have the lower teeth done immediately if I had the money. and the sights along the way to work…about 6-10 miles I’d say. a scoop of each, YUMMO ! Can’t beat 3 days of “soft food” with ice cream at the top of the list ! (the 3 rd night I had a soft noodle casserole). 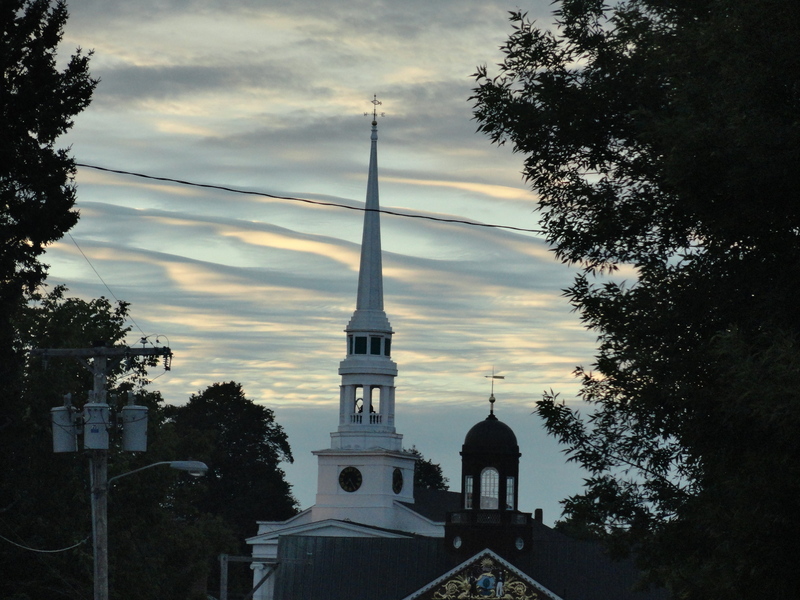 It was difficult to find a place to get a photo of these unusual clouds. What a gorgeous sight for the ride home. 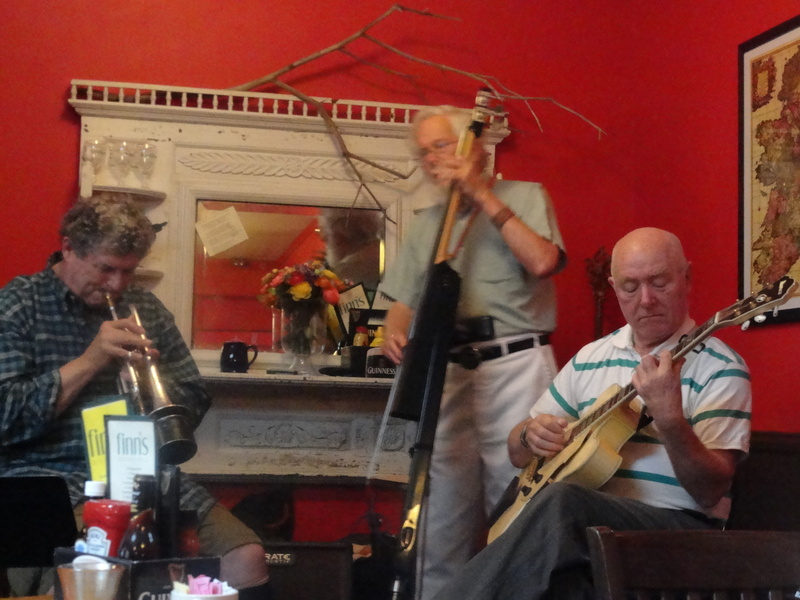 Jazz trio at Finn’s Irish Pub. Excellent music therapy for me ! Thanks for reading all of this…if you got this far…a friend in deed ! as I feel more confident about talking and laughing with others. Off to conquer the world as much as someone my age can ! Dancing Pigs, Acrylic on Canvas. 4″x 4″ from photo by Scott Randall. I find my Dancing Pigs ? The prompt this week is one sentence long. without using the letter “E”. E is the most used letter in the English language. Let’s see how you do with an absent-e! Whatever you need to write one cohesive sentence. to the point to be sure the tree is still there. and hope to have the painting ready to post next week. I like to have the same energy level to finish the painting…. the group has good energy, lovely spirits and souls…. so, tomorrow or Friday, I will be with the group and finish it. but I wanted to show the tent. This is the view of THE tree from the picnic tables. At this angle you can’t see the wedding reception tent. This is my view of the water from where I am sitting. I stood up to get it as my chair was at the end of the table. and a couple got married standing on the rock surrounded by the water. I will post the painting next week. Twin Trees on island off shore, Flye Point, Brooklyn, Maine, This photo shows the island as the tide is coming in. 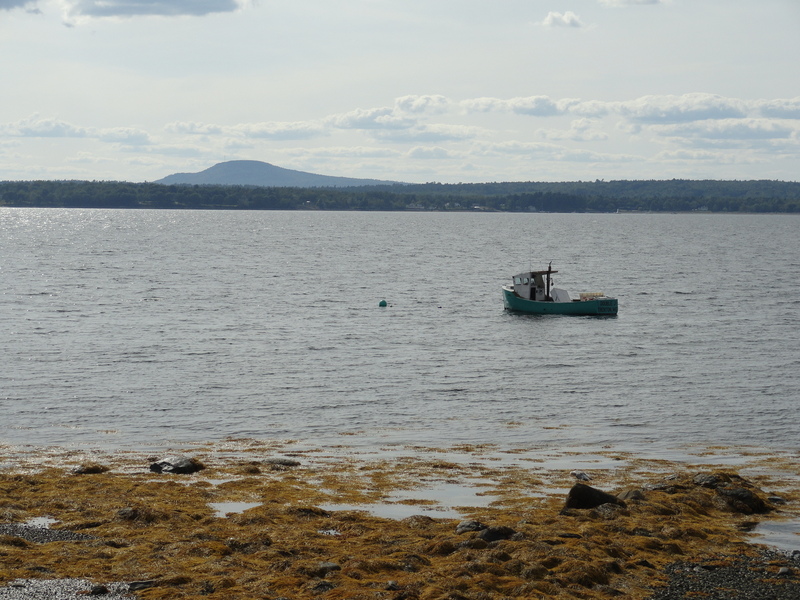 At low tide, a person can walk out to the islands if they are watchful of the turn of the tide and get back to land …. it’s not a far walk as you can see. painting trip to Brooklin, Maine.